It’s not enough to just say you want a good filter on your fish tank. There are parts to every filter that make it work and make it the best that it can be. Canister filters serve as one of the most important components to a successful fish tank and figuring out which one is the best canister filter for your fish tank depends on quite a lot of factors. An aquarium canister filter is the component that intakes the water from the tank to be purified before it is returned to the tank. Different fish tank canister filters use different components and mechanisms to do this, whether it be an intake tube, a sieve, or valve, all canisters pull the water into a pressurized canister, filter the water, and then return it to the aquarium. It’s a multistep process that we often don’t even notice is happening when using the best equipment. The majority of aquarium kits come with power filters that typically sit inside the fish tank. Sometimes they are hidden behind screens or internal walls, but often power filters are in plain sight. A canister filter will sit under or behind your aquarium and will be out of sight, therefor giving your fish more space to swim and will give you better views without unsightly aquarium accessories. Canister filters are also typically more powerful and do a better job of keeping your fish tank clean. So, what do you need to keep in mind while shopping for the best canister filters for your aquarium and fish tank? Well, first and foremost you want to consider the safety of your fish. The canister filter is going to be vacuuming water in and you’ll want to make sure you get something with power that matches what it is your fish can handle. There’s plenty of tragic stories out on the internet about fish that couldn’t handle the current of the filter and ended up getting sucked in. So make sure whatever power of canister you get, it fits what your fish can handle. 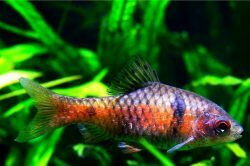 You can do this by looking at specific sizes of filters in relation to your aquarium. This Fluval Canister Filter is a multistage filtration system that works for both fresh and saltwater aquariums. 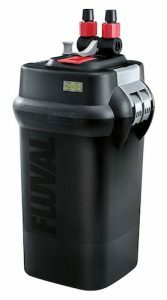 The Fluval 206 Canister Filter is suitable for aquariums up to 45 gallons where as the Fluval 406 External Canister Filter is suitable best for aquariums up to 100 gallons, which makes them suitable for an entire range of moderate and large sized fish tanks. That being said, there’s multiple size options depending on your tank needs, ranging anywhere from small 15 gallon tanks to 100 gallon aquariums if your needs go that far. No matter which size of canister you choose, they all implement a 3 media stage for filtration cycles and output anywhere between 50 gallons and 260 gallons depending on the size of the tank and the canister you’re using. 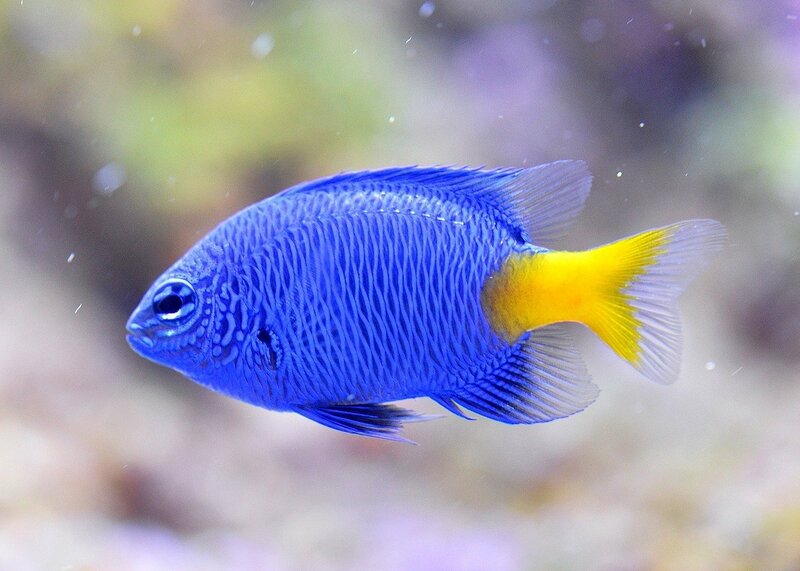 The external filter utilizes sound dampening technology to allow for quieter operation, as filter noise is one of the biggest complaints fish owners have about their aquariums. There is also a clog-proof intake strainer with a dual layer foam screen and a patented valve design along with long lasting filtration baskets. There are some possibly drawbacks to this device, however. Some leaking can happen as well as cartridges that crack easier than expected, so you’ll want to keep an eye on the wear and tear of the device as well as the physical strain you have going on it. The Hydor canister filter is designed for several gallon capacities depending on the model and your needs. Across all of them you will get a no water by-pass control that insures the water goes through the media baskets and nothing gets missed in the filtration, thanks to the flush design. There is a ball-valve connection to allow flow adjustments and an easy flow shut up should you need it. There is a promise of no vibration on this canister and very low noise. As for the sizes. The Hydro 150 operates for anywhere between 20 and 40 gallons of water. The Hydor 250 is optimum for 40 to 75 gallons of water. The Hydro 350 sits somewhat in between for 60-100 gallons of water. The Hydro 450 is the next step up for 75 to 125 gallons of water. And for the largest option it’s the Hydro 600 for 90 to 150 gallons of water. The sight overlap of functions helps to ensure you’re getting the best and most specific capacity needs filled. When in doubt and close to the upper range, we recommend getting the next size up. The biggest complaint for this model is that on the rare occasion that replacement parts are needed, they can be expensive and difficult to get. The Hydor strives to not often need them but if you’re someone who wants a little bit of insurance on your filter, it can be a factor you’ll want to consider. The EHEIM canister filter is a great filter that includes complete filter media, such as Mech and Substrat Pro components and valves. The sealing ring at the top of the canister is sealed with permo-elastic at the pump head, which makes sure that dangerous components don’t get out and nothing gets in. On the flip side, it’s easy to operate and open for quick and easy cleaning. It also comes equipped with filter sponges, a spray bar, an inlet pipe, a hose, and instillation accessories to make installing it a breeze. The EHEIM canister filter setup comes in several sizes depending on the needs in your fish tank. The Classic 150 is the smallest size and option measuring 6.3 inches by 8 inches by 18.98 inches and good for fish tanks up to 40 gallons. The next size up is the Classic 250 model that can handle up to 66 gallons, and then the Classic 350 goes up to 92 gallons. There are some assembly dangers when it comes to the plastic components within the canister that can crack and break when handled too much. There is also the issue of leaks in the bottom port. This is also one of the noisier options for a fish tank canister filter so you’ll want to keep that in mind both for yourself and for your fish. The Marineland canister filter is another multi-sized canister that allows for use across tank capacities. The lid of the canister ensures a watertight seal against invaders and any escape of the contents within. The filter acts not just as a purifier but as a polisher that removes fine debris and materials from the water and the bio-filter features balls and ceramic rings that provide a large surface area for bio spire growth. 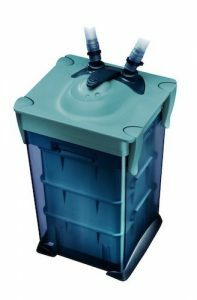 The options of sizes on the Marineland canister are the 160 filter that handles up to 30 gallons, the 220 filter, which handles up to 55 gallons and the 360 filter that can take on up to 100 gallons of water in your fish tank. All versions included black diamond carbon to remove odors, discoloration, and impurities in the water as well as an included filter foam screen for dirt and physical debris. The instructions for installation on this canister can be a bit difficult to understand and, once installed, it’s slightly noisier than some of the other models have reviewed. The tank flow rate is slightly lower than other models as well, so think about going a size up if you are close to the maximum aquarium size rating. 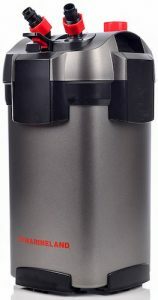 The Penn Plax Cascade 1000 filter is a very user friendly water filter canister. It’s got a self-primer, usable with the push of a button and an independent 360 rotation on the valve caps. The base is tip proof and sturdy to avoid accidents and there is adjustability on the flow rates depending on your needs and the safety of your fish. Though the Cascade 1000 can handle up to 100 gallons of water, there’s several options above and below. The Cascade Black Elite 500, the Cascade 500, and the Cascade 700 can handle 30 to 65 gallons. 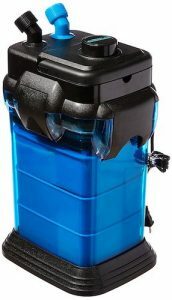 Above, the Cascade 1200, the Cascade Black 1500 Elite, and the Cascade 1500 can handle anywhere between 150 and 200 gallons of water in your fish tank. These canisters aren’t super resistant to impact so you’ll want to be mindful of cracking on some components and the head unit can leak through a screw hole that’s not water tight sealed, despite the water tight seal on the rest of the canister. This is a small but powerful power pump canister that can take on a range of wattages depending on the model and water capacity guidelines. The Sunsun canister filter is a 4-stage filter that can take on about 370 gallons per hour or 525 gallons per hour when it comes to cycling, depending on which size filter. It includes filter pads, hoses, and other accessories that are necessary to making sure the canister and filter run smoothly. There are also flexible media trays and activated carbons for optimum filtration. The sizing options range from up to 75 gallons, up to 100 gallons, and up to 150 gallons depending on which Sun Sun canister filter you get and what the needs are for your tank and your fish. On both there is an algae control as well as bacteria control that promotes good bacteria for cleaner water while making sure the bad bacteria is kept under control. Like a few of the items on this list, leaks are one of the primary fears when it comes to this canister. It’s also been known to not be an incredibly long lasting canister filter so if you want something more permanent, you’ll want to look into other models. The API Filstar XP L Canister Filter is a very powerful and easy to use filter that runs the gamut of sizes, all while staying fairly compact and small. Across the models, the operation is quiet and nearly silent while the canister itself is self priming and easy to use without too much user interference. At the bottom of the spectrum there is the API Filstar XP-S Canister Filter for up to 45 gallons of water in your fish tank. The medium option is the API Filstar XP-M Canister Filter for up to 75 gallons. The large option is the API Filstar XP-L Canister Filter for up to 175 gallons. And finally, the largest option is the API Filstar XP-XL Canister Filter that can handle a whopping 265 gallons. The pitfall here is, unfortunately, the possibility of leaks. While many of these leaks can be chalked up to improper installation, it’s still a very important factor to consider before making an investment, and make sure to read and follow directions completely. The Aquatop canister filter is unique in that it utilizes a UV sterilization for incredibly clear and purified water. It’s got a self-prime mechanism and is an extremely quiet device. Across all the size options it has a 3 in one stage filtration system. The smallest size, CF 300, utilizes mechanical filters of pads and sponges. 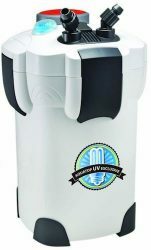 The two larger sizes, CF 400 and CF 500, include the mechanical filters as well and chemical filters and biological filters through a 9-watt UV filter and sterilization process for unique and complete filtration of water. The three sizing options are the CF 300 (264 GPH) which can do up to 75 gallons of water in the tank. 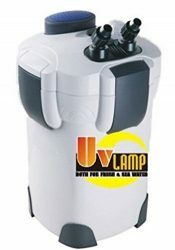 The middle option is the CF 400UV (370 GPH) which can handle up to 125 gallons of fish tank water and includes a UV filter. And the final option is the CF 500UV (525 GPH) which can handle up to 175 gallons up aquarium water. Despite the very unique filtration process, there are some minor issues here. For one, the installation process can be a bit taxing and a little bit complicated. It’s also not designed to be used over a very long duration of time so after a few years or so you might want to look into investing in a canister a little more long term. Above are a lot of canister options that range in sizes from 15 gallon tanks all the way up to 400 gallon aquariums. The canister you choose is highly dependent on the tank size and the safety of your fish is imperative to this so do some serious research with our list to ensure you’re getting the best and safest option. There are small canister filters, external canister filters, and full sized within our list of the best aquarium canister filters. There are a lot of options we didn’t cover including the Magnum 350 canister filter, which is a good product but barely edged out of our list. In this list of the best canister filters, we also didn’t cover mini canister filters, nano canister filters and charcoal canister filters, which we will try and cover in subsequent buyers guides. We also recommend going a size up if you are close to or at the maximum, to ensure you do get the best canister filter for your setup. 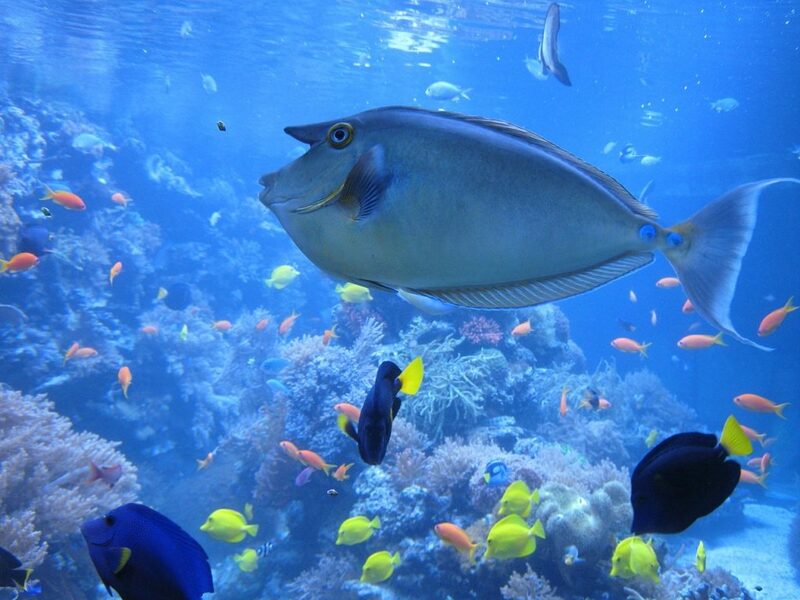 This will ensure your fish are safe and their aquarium environment is kept clean and healthy. As always, this guide is all about safety and security first. So we hope you find the right filter canister for your fish friends. Lets us know if the comments if you have any first hand experience or questions.